Crescent connector charm, old silver pewter, vintage crescent link, set stones, pewter castings, B'sue by 1928. 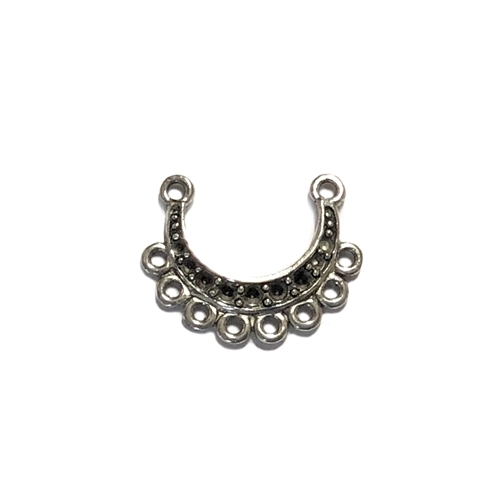 Beautiful crescent connector charm to set stones in and perfect centerpiece. Multiple uses, charms, bracelets, necklaces, or earrings. Measures 17 x 22mm. Stones or pearls can be added to make the right bling to make it your own (1-2mm) and loop drops. Tumbled pewter with specialty lacquer finish, nickel free, and lead free castings. It has a copper base over pewter. Gingerbread pewter, a specialty artisan finish unique to this line.